The first phase of the highly anticipated Frisco Fresh Market opens this weekend in the heart of Frisco. This is a one of a kind family-friendly destination with a mission to connect local producers, artisans and farmers to chefs, restaurateurs, food organizations and the people of North Texas. Located at the intersection of Main Street and Frisco Street adjacent to the east side parking lot of Toyota Stadium, it’s easily accessible from all routes. One of the largest permanent facilities of its kind in North Texas, Frisco Fresh Market is committed to bringing fresh produce and meats along with many other specialty goods from local vendors. Inspired by the iconic European markets, where food, art, music, and people commingle in colorful open-air emporiums, Frisco Fresh Market brings sustainable, healthy food to North Texans from Texans. Our priority is to showcase and support small business, the freshest produce and specialty goods. We feel there is a shift in people’s expectations and the customer wants quality products on a consistent basis. We’ve traveled thousands of miles to meet fourth, fifth and sixth-generation farmers and ranchers who have become the best of the best at what they do. Each of them entrepreneurs in their own right, bringing some very cool concepts to the people of Frisco. What can we expect from this uniquely inspired market in Frisco? The Outdoor Market celebrated a soft opening and ribbon-cutting ceremony on June 29, and will officially open Saturday, June 30. The Market is thoughtfully designed, and the vendors carefully curated from all over the country. Over 90 booth spaces of varying size and layout across 16,000 sq. feet. Fully equipped with water, electricity, and sinks for onsite cooking vendors. Spacious storage area including cold storage and industrial-sized freezers. No product will go to waste, while also allowing customers to safely store purchased items while they continue to enjoy the rest of the market facilities. Our team attended an official media tour of the Outdoor Market. Enjoy a SNEAK PEEK photo sideshow, below. We wanted to bring something unique to the people of Frisco and be a part of this outstanding community. We operate according to the CHIPS model (C –Customer experience, H – Honesty, I – Integrity, P – Product quality and S – excellent Service), the hope is that Frisco Fresh Market will be a model destination for fresh produce and artisan products. Incorporating 150 Local Artisans and specialty vendors (including Frisco’s own Tumbleweed TexStyles). 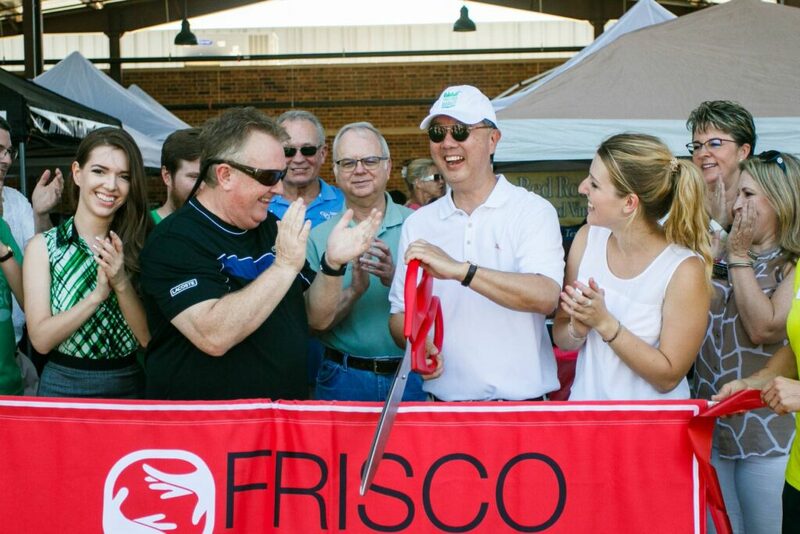 At the ribbon cutting ceremony on June 29, Cheng expressed sincere gratitude to the City of Frisco and Frisco Chamber of Commerce for their support so far and he looks forward to a continued relationship as they work together on the remaining phases. In addition, beginning in late 2019, Frisco Fresh Market will also make both indoor and outdoor spaces available to rent on days the market is not in full use. Suitable for weddings, birthdays, family reunions and corporate events, a variety of rental spaces will be available to utilize along with private parking and a valet service if required. Described as “Modern Life by the Market” the Waterford Market is a luxury apartment complex incorporated into the overall Frisco Fresh Market Development. This sprawling mixed-use development will also incorporate three hotels, retail and office space including the latest in co-working facilities brought to you by 25N Coworking. 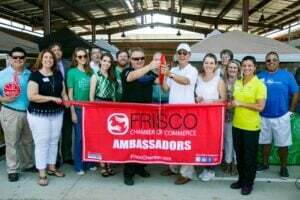 Frisco Fresh Market is excited to present the Frisco community with their one-of-a-kind facility and they’ve planned fun events throughout their opening weekend including live music, caricaturists, face painting and balloon artists. The Grand opening will take place from 9:00 am – 6:00 pm on Saturday and Sunday, June 30-July 1, and they’ll stay open until sundown on Wednesday, July 4. Ongoing operating hours will be Thursdays and Fridays from 11:00 am – 6:00 pm, and Saturdays and Sundays from 8:00 am – 6:00 pm. At some point or another, most of us have experienced recurring or even debilitating musculoskeletal pain in our body. Do you suffer from migraines or fibromyalgia? Maybe you have hip, shoulder, or low back pain? You may be battling chronic pain right now! Forgo the old motto “no pain, no gain” because untreated pain actually increases blood pressure, heart rate, and cortisol levels. While no one wants to leave pain untreated, finding a truly successful treatment program for your condition can be difficult. Airrosti has gained recognition across the fitness industry, and many people refer to it as a miracle treatment. If you’re a ‘Crossfitter or an avid participant of Camp Gladiator then you’re most likely familiar with Airrosti; it’s the preferred treatment methodology of both organizations. Airrosti stops pain so that pain doesn’t stop you. After years of chronic and debilitating hip pain along with temporary loss of mobility in my left leg after running, I opted to investigate this alternative therapy. I had a conversation over coffee with Dr. Jonathan Welch, an Airrosti Certified Provider in Frisco, who comes highly recommended in the area. I was apprehensive at first, having heard horror stories from people I know about chiropractic adjustments gone wrong. To alleviate my concerns, I met with Dr. Welch a few times to discuss, and better understand what the treatment and therapy involves. Now, having experienced Airrosti for myself, I refer to Dr. Welch as the doctor with ‘magic hands’! What does this “magic” treatment entail? Airrosti stands for ‘Applied Integration for Rapid Recovery of Soft Tissue Injuries’ and is a patient-centered treatment approach that addresses the origin of soft tissue injuries. Sessions are one hour long. The first thirty minutes are spent with the doctor who will conduct an examination of the client’s posture and body movements to better understand how their alignment is being affected. The 2nd half of the session is spent with a Certified Recovery Specialist who teaches the client to be proactive about their personalized recovery plan. Rehabilitation exercises are demonstrated and practiced together to ensure they’re being performed properly. It’s a teach-back moment! Typically a patient recovers from their pain within 3.2 sessions. During an Airrosti session, the doctor will also perform myofascial release. When I first heard Dr. Welch reference myofascial release (MFR) I looked at him like he had four eyes and horns sticking out of his head. Say what? MFR is a treatment process where a doctor applies manual pressure with their thumbs to balled up myofascial tissue. The doctor will target a large area of muscle that feels sensitive, tight and rigid. During my treatment, Dr. Welch applied pressure to my left hip, pelvic region, and low back area…the primary pain points on my body. Be prepared, because MFR hurts! I would imagine the receptionist in the hall probably heard me repeatedly exclaiming ‘OMG!” But, when I stepped off the table and stood up it was a WOW moment – there was an evident release of my pain. Like magic! Why is MFR important? The procedure helps to ease constricted muscles, improving blood flow to the area. It also improves the lymphatic system and helps break down scar tissue. Think of pulling a string on a crocheted sweater and it knots up in a certain spot. Or a knot in a rubber band that has to be manipulated to unbind. Athletes like Tom Brady (New England Patriots), Kevin Love (Cleveland Cavaliers), and Jason Giambi (previously of New York Yankees) utilize MRF treatment methodology to relieve pain and improve their athletic performance. Gerad Butler (one of my favorite male actors!) also is known to utilize MFR. My Airrosti sessions helped me to discover that I was doing too much forward spinal flexion which created low back pain. While I worked my core muscles during running I failed to fire up my glutes which created pain in the hip. The great thing about the Airrosti treatment process is that it teaches you how to be proactive about your health to prevent further pain and immobility within the body. If you’re struggling with pain in your body consider a shift from the “no pain, no gain” mentality and adopt a new motto: “Airrosti Therapy to be pain-free!” Obtain better mobility in your body and get back to doing what you love! You can reach Dr. Jonathan Welch at 1-800-404-6050. He’s conveniently located at 8380 Suite 100, Warren Pkwy in the heart of Frisco. You might just have a WOW moment too! Workout Tip: Keep a foam roller at home, and a lacrosse ball. These items can be utilized to roll out scar tissue and balled up myofascial areas. They can be purchased at a sporting goods store, Target, and inexpensively at Marshall’s. This week, let’s meet Jenny Dean, Founder of Jenny Dean Fitness, and a Frisco fitness pioneer. Jenny believes in the effectiveness of “shocking your muscles” to change your body and your mind giving anyone, regardless of their genetic shape, long, lean muscles and true body happiness. While appearance certainly isn’t everything, your personal style says a lot about your personality and allows you to express yourself. Whether you love bright colors and patterns, or neutrals and simple statements, accessories are the perfect accent to any great outfit. If you keep up with industry trends or you’ve visited Legacy West recently, you’ve probably caught a glimpse of the new Rustic Cuff showroom. Founder and CEO Jill Donovan built her now-famous jewelry brand from the ground up by combining exceptional craftsmanship with a personal, heartfelt mission to share kindness with others. Despite her skyrocketing success, Jill Donovan got her start in business almost by accident. She was teaching law classes at the University of Tulsa when she decided to expand her skills and find a new hobby. Jill absolutely LOVED cuff bracelets, so she began teaching herself to make them at night in the guest bedroom of her Tulsa, OK home. After mastering the art of cuff-making, Jill moved on to other jewelry and began gifting her stunning creations to friends and family. Nearly everyone who received a cuff became an instant super fan; they urged Jill to turn her newfound hobby into a business so that others could enjoy her stylish, wearable artwork. Oprah Winfrey wearing a Rustic Cuff design on the cover of her magazine. After some reluctance, Jill decided to take the plunge and open the first Rustic Cuff showroom in Tulsa, Oklahoma. Overwhelming success led to the opening of two more showrooms in Tulsa, followed by expansion into other states as well. The Rustic Cuff brand quickly rose to fame with television appearances, magazine features, and celebrity endorsements. Products are sold all over the United States and International orders allow Jill to share her passion worldwide. The company’s momentous success can be credited not only to the products themselves but more importantly to the heartwarming message behind them. For Jill and the founding team that developed the business in her kitchen, Rustic Cuff isn’t really about the popularity… It’s about the people. My only goal is that a person leaves happier than when they came in. It’s not just about the bracelet. It’s about the relationship. True to their roots, gifting remains a strong theme throughout the business. Jill even encourages her team to gift a cuff or other product if ever they feel led. She shares this same passion with her fans through the captivating Regifters Club. Each month, Regifters receive two cuffs for the price of one – a cuff to keep and a cuff to share. Many times, RC fans can even attest to giving taking a cuff right off their wrist and sharing it with a stranger! Kindness is contagious, and it’s no wonder that Jill’s company has seen such a surge of generosity facilitated by beautiful cuffs and other accessories. In addition to running a highly-successful business, Jill also enjoys motivational speaking, and even wrote a book on the joy she found through sharing gifts with others after a surprising appearance on the Oprah Winfrey Show. Maybe you haven’t had a chance to visit a Rustic Cuff showroom yet, but you’ve probably spotted one of their beautiful pieces on a friend’s wrist. Though ‘cuff’ is in the name, the brand has ventured far beyond this style to include a range of bracelets for women and men. Embrace warm weather and sunny skies with the Endless Summer or Poolsides collections that feature bright colors and bold patterns to will make any outfit pop. You can also show your spirit with a festive piece from the new 4th of July collection or support your favorite school with some collegiate bling! Rustic Cuff truly carries something for everyone. Their versatile Father’s Day collection featured handmade leather gifts, engraved money clips, journals and more (a men’s collection is available year-round). No matter your style or price range, when you visit a Rustic Cuff showroom, you’re sure to find not only stunning accessories but a culture of kindness as well. This post is sponsored by Vitality Bowls. Did you know that some scientists say that your stomach is your second brain? Due to a bundle of nerves in the digestive system that operate similar to the brain, the stomach also aids in decision-making for the body to function properly. Therefore, let’s make the quality decision to feed your stomach foods rich in nutrients to have strength, energy, clarity, and enhance your mood. When you need a “meal improv plan,” Vitality Bowls has you covered with fresh and wholesome menus options. Consider it your kitchen away from the casa! 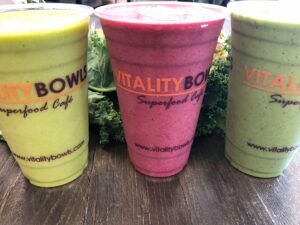 For summer, Vitality Bowls added new menu options to include the “Sunshine Bowl” and the “Sunshine Smoothie.” Both items include the “super spice” turmeric which is known for its anti-inflammatory properties. Not only are these food options great for post-workout nutrition, they’re also good for the skin. The base of the Sunshine Bowl is Acai blended with almond milk, fresh mint, strawberries and mango. The toppings are organic hemp/flax seed granola, fresh pineapple, strawberries, mulberries and honey. Needing an extra dose of energy to survive your crazy work day? Or are you in need of extra stamina to keep up with your high spirited kids? Since nutrition and fitness go hand in hand, Vitality Bowls is partnering with Triple Link CrossFit. During the CrossFit grand opening in May, Vitality Bowls took the opportunity to educate Crossfitters on the benefits of a healthy diet and menu options that will enhance their workout. At the event, Vitality Bowls passed out Acai bowls as well. Triple Link Crossfit members also receive an ongoing 10% discount during each visit to the store. Vitality Bowls has also teamed up with Camp Gladiator for the summer to promote their Total Transformation Package. This promotion advocates healthy meal options that will supplement the exercise regimen to aid in transforming people’s bodies. Nutritious eating plus a fitness regimen creates overall lifestyle changes. If you’re trying to reach your body goals, signing up for the Total Transformation Package might be the way to go. Plus CG members receive a 10% discount at Vitality Bowls. “Maca Me” is a great pre-workout smoothie option boosting your energy and endurance levels. If you prefer the juice bar, opt for ‘The Invigorator,” but if you’re tired all the time and dragging along, “The Intensifier” might be what you need since it includes ginger for that extra jolt of energy. Ginger is also known for its ability to reduce inflammation, lower blood sugar levels, improve digestion, and enhance the libido. If you are experiencing muscle soreness, order ‘The Rehydrator” which includes pineapple. The bromelain found in pineapple reduces swelling and inflammation in the body. Another great anti-inflammatory juice is ‘The Rejuvenator” since it contains beets. Low in calories and high in water which promotes a feeling of fullness, with beets there are no worries of overeating post-workout! The “Sunshine Bowl” or “Sunshine Smoothie” is another great post-workout option since it contains turmeric. This spice is considered to be more powerful than Ibuprofen and Aspirin. If you’re vitamin deficient, aim for the “Warrior Bowl” that provides a multivitamin boost. In need of serious protein? ‘The Hulk” smoothie is what you want. Containing guarana which provides an energy boost and includes whey protein. You might even add an extra dose of protein with add-ins like almond butter or peanut butter. Lace up those sneakers, marathon runners… Vitality Bowls has foodie options for your success! Vitality Bowls has dedicated menu items for mara-runners and Crossfitters. While any of the menu items work, you may need additional carbs and protein. Consider the Roasted Turkey or Sirloin Panini. Vegetarian? Try the Strawberry Spinach or Kale Salad. Maybe add avocado for a healthy fat option. Or maybe you like a little meat on your salad, opt for adding roasted turkey or sirloin for extra protein. With any Bowl, Smoothie, or Juice, you have the ability to add in whey or pea (veggie-based) protein, matcha, guarana, and multi-vitamin blend. With a strong commitment to bring health and wellness to Frisco through fresh, high-quality superfoods, Vitality Bowls is busy feeding your belly and your brain with healthy, nutrient-rich foods… It’s guilt free eating! The Museum of the American Railroad’s Frisco attraction, TrainTopia, opened to the public on July 18, 2018. This layout is Steve’s life. It’s a history lesson, a geography lesson and it’s all about the trains. Steve would be thrilled because he wanted a lot of people to see his trains. With an estimated value of more than $1 million, TrainTopia is a G-scale model train set with a one inch to one foot ratio and has six precision trains that run simultaneously. The layout spans Arizona to Texas, with dramatic rock formations of the Four Corners region near New Mexico, to a thriving Northeast Texas in the early 1960s. There’s an animated downtown Dallas street scene, including a bustling Union Station, the famed Palo Duro Drive-In Theatre, West Texas refineries, and working sawmills in the mountains of Colorado, plus over 200 cars and locomotives throughout the exhibit. The rail industry is in our city’s logo. It truly reflects who we are as a city. I loved trains when I was a kid. This exhibit is about kids who will be able to enjoy this extraordinary gift in Frisco. Brint and Amanda Ryan generously donated funds to make moving and reassembling the set in Frisco possible. The family saw the vision and stepped forward to get involved. The Railroad is in our blood. I love Texas because of the railroad, and I wanted to give the gift to future generations to enjoy. It’s important to share our heritage. The journey the train collection took from the Sanders’ home in Dallas to the 3,000 square foot space in Frisco was not easy. The team who executed the move has logged more than 1,060 hours to disassemble, relocate and set up the 570 pieces and display that span approximately a quarter of a mile long. Call it a labor of love combined with respect and passion for upholding the history in these small but powerful pieces, the Sanders family, the Museum staff, the City of Frisco, the engineers and the contractors have played their part in making TrainTopia come to life. TrainTopia is located within the Frisco Discovery Center at 8004 North Dallas Parkway, Frisco, TX. The hours of operation are Wednesday through Saturday from 10am to 5pm and Sunday from 1pm to 5pm. Ticket prices are $8 for adults and $4 for children. To purchase tickets in advance, visit www.HistoricTrains.org, or tickets may also be purchased in person at the Discovery Center.